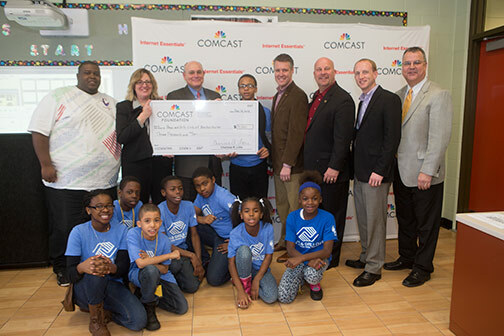 Comcast joined the Boys & Girls Clubs of Benton Harbor (BGCBH) today in an effort to promote technology skills among area youth. To this end, Comcast presented a check for $3,000 to support the BGCBH’s “Power Hour” program, which helps club members with their homework and teaches them important skills, including how to assemble working computers. Club members earn points for each computer they assemble. If they earn enough points, they can take a computer home with them. The donation from Comcast will be used to support the program and purchase the components club members need to assemble and earn the computers. Comcast also gave an update on its Internet Essentials’ program’s progress in the area. Internet Essentials is the nation’s largest and most comprehensive broadband adoption initiative for low-income families. Internet Essentials helps close the digital divide by providing eligible families low-cost broadband service at home for $9.95 a month. Participating families also can purchase an Internet-ready computer for less than $150 through the program, as well as access digital literacy training sessions and materials online, in print and in person. To date, nearly 1,500 families in the Michiana area have enrolled in the program. By June 2013, less than two years after its inception, more than 220,000 families nationwide – or an estimated 900,000 low-income Americans – had enrolled in the program and gained access to broadband Internet connection at home. And this fall, going into the program’s third year, its momentum started increasing. On average, through December 2012, about 50,000 households had enrolled each month. In the first six months of 2013, that number had increased to 70,000. Since the program’s inception in fall 2011, Comcast has distributed more than 18,000 subsidized computers; provided digital literacy training to nearly 20,000 people; publicized the program in more than 4,000 school districts and more than 30,000 schools; broadcast nearly 2 million public service announcements and partnered with nearly 7,000 community based organizations, agencies, and officials – about 1,900 alone here in Comcast’s Greater Chicago Region, which includes Southwest Michigan – to help spread the word about the program. This entry was posted in 2013 Community Investment, 2013 Press Releases, GCR News. Bookmark the permalink.